Really, I do not have a relevant title for this post at the moment, but I guess you could say that I feel the term "Shake n' Bake" somewhat sums up what has been going on over the past several weeks. I could do nothing other than look at the laptop and let my mind be consumed with everything else. 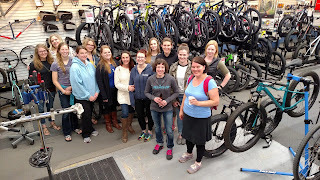 I was given an offer pertaining to blogging that was hard to refuse, but in reality, I knew that I would not be able to juggle that job with my full-time job at Decorah Bicycles. Especially during the busy season...and that made me shrink back into myself for awhile due to my questioning "Did I really make the right choice for myself?" Looking at everything after I've had time to digest my response, the answer would be yes. At least this time. 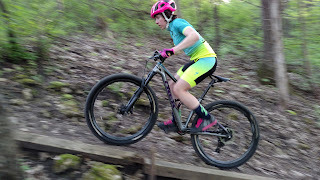 A lot of my energy has been going to planning further women's rides, a mom/daughter intro ride, my women's night in August, and consuming myself with worries over the lack of "training" for Chequamegon. In reality, there has been a huge lack. I'm wondering if I even care? I'm really more excited about trying to plan women's events and rides for NEXT year vs. worrying over how well I will do at a race I will never "win" at. Life has had stresses yet good things. I would say one of the biggest blocks in my riding as of late has been...well, me. I've been paying more attention to my menstrual cycle and more attention to the ongoing and nagging cramps I've been experiencing before, during, and after. Yes, it seems that my body would be going thru a continual cramping without any real relief from it- minus giving myself stomach aches from too much ibuprofen. I have an IUD (at the time of writing this post) and it's been wonderful, but something changed. I also noticed and would be frustrated over how I would feel after long races (cramping.) Not only do I get to deal with chronic shoulder discomfort, but I would have to deal with feeling pain "down there" as well. Gosh, that really makes you feel like you want to go bust out 12ish miles for Time Trials for crank out almost 40 for Borah Epic. Then I had a ridiculously early period. Enough was enough. I made the decision to go see a new Dr. and get things checked out. In my mind, I had to quiet the thoughts of all the possible things that could be potentially "wrong" with me. One thing led to another- blood work to check my thyroid (as there are thyroid issues on my paternal grandma's side.) That came back great. Uterine ultrasounds (external and internal) to check and see if there would be anything like cysts or fibroids. Nope. It's so fun to have menstrual oddities happening to you in your late-early to early-mid 30's. Especially during a particularly busy year. Stress was being handed to me left and right...what a beautiful opportunity to work on embracing the unknown. What was deduced was that the arms of my IUD are poking into the sides of my uterus. I do not believe it's to the point of embedding itself, but it wouldn't surprise me that it has shifted over the past year or so. Tuesday I will get it out. I can't tell you how relieved I feel. Sure, I'm back to square 1 in the whole ongoing process of "Josie doesn't want to have kids" however, the feeling of "I can finally STOP feeling like something is scraping the inside of me!" trumps the whole "What the hell am I going to do now?" It's freeing. I'm actually looking forward to Chequamegon now...even if I end up having my period. Because I won't have to deal with the discomfort that I felt because of the IUD vs. the period itself. I am looking forward to hammering it out on the trails, because I know I won't have that godawful feeling of feeling like I have nails on a chalkboard happening inside. I really can't stress how frickn' EXCITED I AM!!! I have spent virtually ALL of my biking years with an IUD and have always had some sort of "eh, this doesn't feel great" post-ride. I suppose I'm not a hospitable host for such things, and you know what? That's okay. I experienced it for a total of 9 years with two different IUDs and I'm going to be glad to have one less thing bringing me down a notch with riding with hopes I'll be able to ride with more power. In other news. I will be getting a full suspension bike for next season- it's not officially decided yet if we will keep Gaston the carbon Salsa Spearfish (size small/16") at this point (because I really do love the bike) but I am open to SERIOUS inquiries on if anyone would want to purchase the frame/fork/Industry 9 wheelset either all together or separately. This has been an excellent bike and the decision behind having it leave the stable is due to the fact we are no longer Salsa dealers. For my blog as well as general social media, we (Travis and myself) feel that it would be more appropriate for me to be riding a shop brand. I will be riding Gaston thru the end of the season because the new bike will not be available until after Chequamegon. Another bike that we will be selling is my road bike. 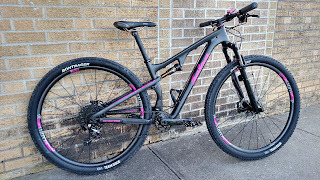 It is a carbon Specialized Ruby Elite Compact EQ (48 cm) I physically just cannot ride it comfortably and I prefer to spend as much of my time on the dirt or gravel as possible. Full disclosure, I did have one crash on the road bike, so the shifter/brake lever did get scuffed up and there is minor bar tape damage. It's cosmetic and totally does not affect how the bike works mechanically. You can see the road bike (Bettie Paige) here. It has ridiculously low miles for the years that I've owned her. We just purchased a replacement seat pack for her as the original one had a funky zipper. I've had 2 rides on this bike this season and am going to admit I just simply do not jive with Bettie and it's time to move on. As I said, serious inquiries only. Fearless Women of Dirt has been going extremely well (in my opinion) and I'm very excited at the potential of having things shape up to be even more involved next year. Especially with my new connections with other women who live outside the area wanting to have FWD group rides. So, one of the things that I'll be doing is changing the format of the rides for 2018. The biggest change is that I will not announce every ride being "introductory" this is especially important because there will be a handful of women who have been joining the rides regularly who would be outside of the "introductory" phase. 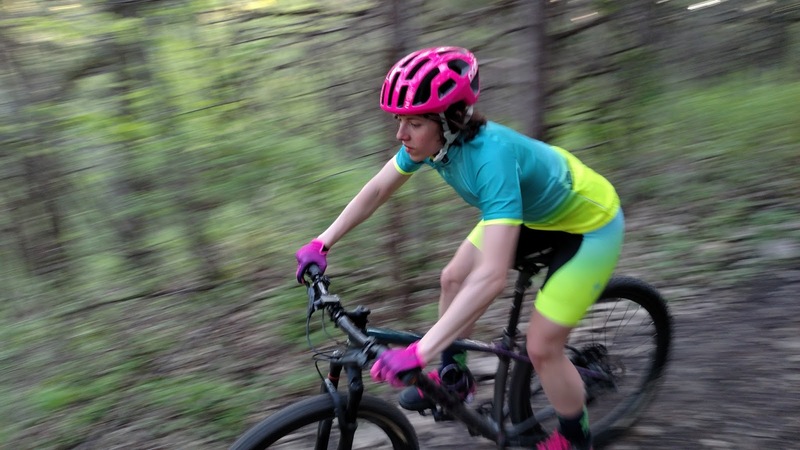 We're exploring new trails and working on handling skills- and without multiple ride leaders being able to show up on the same day, it's hard to cater to all ride levels without one or the other feeling shorted. Until we have more women who would feel comfortable leading introductory rides the same day as the intermediate rides, the first Sunday of the month will be a designated "Introductory" ride at 7:30 a.m. and 5 p.m. All other Sunday rides would be geared towards intermediate and advanced riders. Long term goal: Two Sunday rides, one as an introductory and another for more experienced riders being led at the same time. Then we all meet at the shop or somewhere for a beer. Yeah! FWD Women's Nights will happen again next year and I aim to make them more involved. This will possibly entice women from out of town to make a trip to Decorah that will be more than just "Hey, let's hang out at the bike shop!" The concept of getting women together will be the same, but the event will start earlier (at 5 p.m.) and have a short off-road ride session prior to the social hours. We would have a ride leave the shop at 5 p.m. and we'd come back around 6:30 p.m.
For folks who are new to FWD and want a chance to meet FWD members and learn about our group rides, they are welcome to join the social time from 7:00 p.m.-9 p.m. We'd have pizza and provide some snacks, you BYOB and come learn about what FWD is all about! 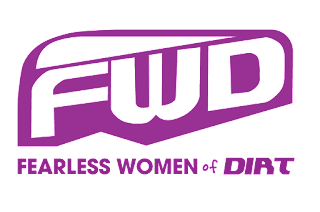 If you read this and are someone I've interviewed that doesn't live too far away from the Decorah area and would like to be a special guest for one of the FWD Women's Nights- let me know! Additional FWD Goal- FWD Jerseys. My idea is these Sunday rides will start at 8 a.m. and last until 9 a.m. I'm toying with the idea of having an additional Tuesday ride for those same months, which would start at 7 p.m. that would give parents an additional day to have possibly work with their schedule. I'm open to suggestions as I know parents and kids are both incredibly busy and there is no possible way to make it work well for everyone. 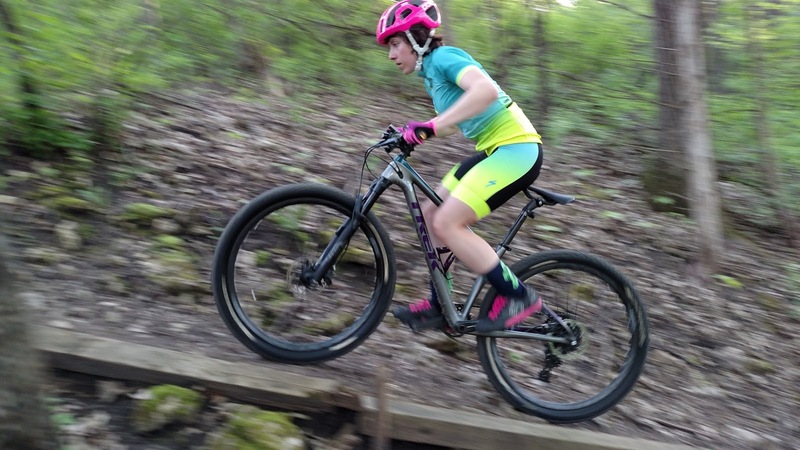 For kids who are old enough to attend the Park and Rec mountain biking class next year- this would give them another ride opportunity (or two) that should help bolster confidence and comradery with other female peers. So, obviously things have been a bit hectic, but overall things have been well. My emotional and mental overload will pass and I'll have some introspective things to share again. This has been quite the year and I'm really grateful for the opportunities that have come from it so far.